Burt's Bees Sweet Almond Bath and Body Oil is made up of 98.50% natural ingredients that are devised to moisturize and nourish the skin. The infusion of lemon and almond oil should make this bath oil a very sweet scent indeed. I also find it a big plus that Burt's don't test on animals. Almond oil is naturally rich in vitamin E and it is also very moisturizing, helps to relieve irritating skin and helps to improve the complexion leaving it with a natural glow. I have summarized the lists below from the opinions of the people using the bath oil. Sweet Almond Oil, Lemon Oil, Wheat Germ Oil, Tocopheryl Acetate, Tocopherol (vitamin E), Rosemary Extract. Apply oil directly to damp skin after shower or add 2 tablespoons to a warm bath. 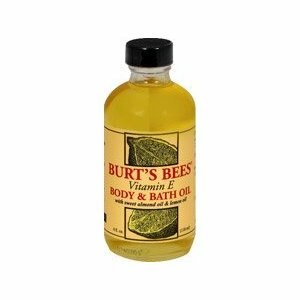 Most people using Burt's Bees almond oil found that it worked very well at moisturizing their skin, they also adored the lemony scent. However, some people thought the smell was more piney/earthy and didn't favor the smell. A couple of users said it was a little too greasy for bath tub use. There are quite a few ladies who commented on how the oil helped reduce their stretch marks. If you like the sound of this bath oil and want to give it a try for yourself it retails for a reasonable $6.49. 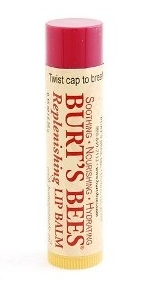 Burt's Bees Lip Balm is designed to replenish and hydrate dry lips leaving them smooth and healthy looking. It contains Pomegranate oil which helps to moisturize and protect the skin and is also high in antioxidants. It is available in pomegranate, honey or medicated and is made with real bees wax. I have a Burt's Bees Lip Balm and it is just brilliant. It leaves your lips feeling soft and smooth. I think it is also good value for money. This lists below summarizes what users think of the balm. Helianthus annuus (sunflower) seed oil, beeswax, cocos nucifera (coconut) oil, ricinus communis (castor) seed oil, lanolin, symphytum officinale (comfrey) root extract, fragrance, punica granatum (pomegranate) oil, tocopheryl acetate, rosmarinus officinalis (rosemary) leaf oil, prunus amygdalus dulcis (sweet almond) oil, illicium verum (anise) oil, cinnamomum cassia (cinnamon) leaf oil, salvia sclarea (clary sage) oil, citrus nobilis (mandarin orange) peel oil, tocopherol, carmine. On the whole this lip balm does everything you would expect from a balm. Although, if a SPF were to be added that would make it an exceptional product for the price. Burt's Bees Lip Balm varies in price from $0.99 - $3 depending where you shop, and you can often pick up multi-packs which are better value, and also handy as it can run out quickly. You are currently browsing the archives for the Burt’s Bees category.